From a minor graze to a complete rebuild we can put your Lotus back together again using the latest in GRP body repair and paint colour matching technology. For smaller areas of damage, smart-repair techniques can be used which means significantly less trauma to your vehicle and less expense to you when repairing minor bumps and scrapes. 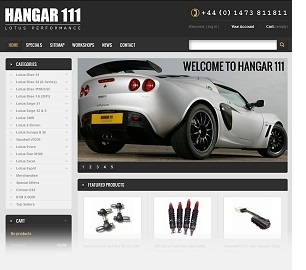 A full range of Genuine Replacement parts is also on hand for your Lotus repair. Where upgraded or performance parts are available, we can often reduce the cost of the repairs while improving the final result considerably. We can ensure that all elements of body repair are completed to the highest standard, giving our customers peace of mind that their Lotus body repair is being handled by experienced and enthusiastic technicians. As well as glass fibre repairs we can also carry out repairs to carbon fibre composites, making race car bodies and lightweight components strong and durable again. Insurance work is often undertaken and quotes happily provided on request. Body shop work can be often be combined with other upgrades, repairs or maintenance work at Hangar 111, which means you get your car back on the road even better than before! If your vehicle cannot be driven to us, we can collect and transport it back to our bodyshop for you from all locations in the UK mainland. This service is also available for routine servicing and repairs. Building the ultimate concours Lotus? We are able to design and paint your Lotus while making sure that the smallest detail is considered, from the careful alignment of rubber seals and trim to the refinement of the engine bay and interior. Alloy Wheel Repairs & Refurbishment – using original colours if required. For more information on our body shop services and smart repairs, please contact us.